When it comes to removing a tattoo, there are several options you can choose from. However, techniques such as dermabrasion, salabrasion, surgical excision, acid peels, and removal creams usually do more harm than good, causing the patient a great deal of pain and less than favourable results. Nearly all medical professionals and tattoo removal experts are in agreement that lasers are the only truly effective way of getting rid of unwanted ink. Here at Andrea Catton, we have the fastest laser tattoo removal device in the world with PicoSure, which has a 75 per cent or greater chance of clearance after one treatment. To add this laser’s impressive ability, we are now proud to offer the PicoSure Boost™, which is capable of removing the most stubborn tattoos as well. 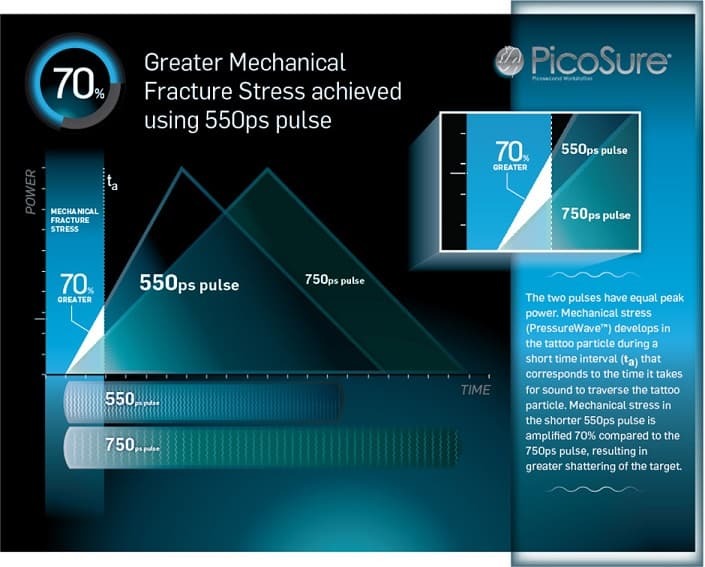 How does PicoSure Boost™ work? PicoSure Boost™ enables the removal technician to adjust the laser’s pressure by changing the output energy. This results in a decreased pulse width, which increases the shattering effect to the ink. In other words, it is more powerful and effective than standard lasers. Thanks to the option of magnifying pressure by 70 per cent and shortening the pulse width, it is possible to eradicate pigment more accurately too and shift stubborn tattoos with the greatest of ease. Cynosure, the manufacturers of the PicoSure, has performed a wide range of parameter testing on tattoos over the past five years. Research showed a dramatic reduction in the density of ink with shorter pulse durations, which was measured by electron microscopy and photographic grading. Analysis also suggested that under the same conditions, a pulse width of 500ps provided a 4x increase in pressure on ink particles. So, with PicoSure Boost™, pulse width is reduced from 750ps to 550ps, which increases the pressure on ink particles by 70 per cent. It is important to note that although PicoSure Boost™ is a more intense treatment, it does not require the laser’s heat to be turned up. Instead, it takes advantage of photomechanical impact and stress to break-up ink into small particles. Here at the Andrea Catton Laser Clinic, we tend to use the PicoSure Boost™ on people with densely inked tattoos that prove hard to fully remove with the laser’s standard settings. It is also utilised on patients where the ink has almost disappeared and requires a final clean up to finish off the job – at no extra cost! For more information about PicoSure or laser tattoo removal in general, get in touch with Andrea Catton today.